Do migrants contribute to innovation in the European Union (EU)? MPC’s recent report attempts to answer this critical question. To measure innovation, our research focuses on migrants’ contribution to patents registered at the European Patent Office. The preliminary results point towards a positive role played by migrants in promoting innovation. What is innovation and why is it important for the EU? According to the European Commission, innovation is defined as “the successful production, assimilation and exploitation of novelty in the economic and social spheres.” Its importance is underlined in the European Council’s Lisbon Strategy which highlights that innovation is important for promoting economic growth, an argument which is supported by the Europe 2020, the EU’s growth strategy. Moreover, EU’s Global Approach to Migration and Mobility (GAMM), through the ‘EU Blue Card’ Directive, provides one of the key policy tools to promote the migration of highly skilled workers in to the EU. Innovation: How to measure it? The recognition that innovation and technical change are amongst the key components of economic growth has pushed economists to look for appropriate indicators. However, measuring innovation is a difficult task since it is a multi-faceted phenomenon. One of the most popular indicators of innovation is the number of patent applications at industry or country level (e.g. Furman et al. 2002). 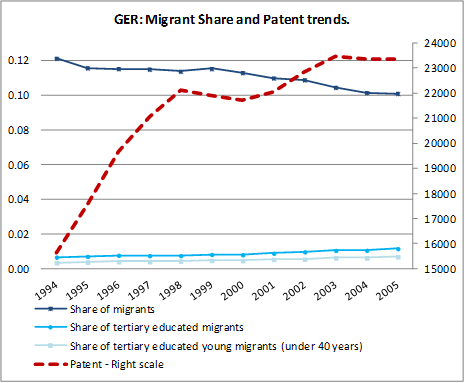 For the purpose of the study, we attempt to assess migrants’ contribution to theincrease in patents registered at the European Patent Office. Why are patents important in measuring innovation? Patent data are considered an important indicator of innovative activity as they reflect the technological effort of companies and non-firm organizations aiming to create new products and processes. In research, patents are used to approximate the innovative capacity of countries. Contrary to previous analyses which used a territorial cross section approach and a diversity index, we analyse the innovative capacity at sectoral level and explore how it is affected by the characteristics of human resources and their demographic trends. The three case countries chosen for the analysis are UK, France and Germany. Though all three are counted amongst the top three economies in Europe, however, they differ in three key categories. Firstly, they differ in their age pyramid, as seen in the case of France, where the young-age population (below 15 years) is 1.35 times the old-age population (above 65 years), while in Germany and the UK the young-age population is smaller than the old-age population (0.85 times and 0.89 times respectively). Secondly, these countries also differ in their dominant production sector. In the UK, the service sector dominates the economy (75% of added value); while in Germany the manufacturing sector has 29.3% of added value. However, in the diverse economy existing in France, it is interesting to note that the agriculture sector still contributes up to 2.8% of added value. Finally, in terms of immigration, all the three countries have a long history of immigration and migrants make up between 11% and 8% of the population. However, they have different migration policies: the UK encourages immigration of the highly skilled labour, while both France and Germany have a tradition of allowing low to medium-skilled migrants and family reunifications. Our analysis includes four variables: age, level of education, type of occupation, and the distinction between migrants and natives. 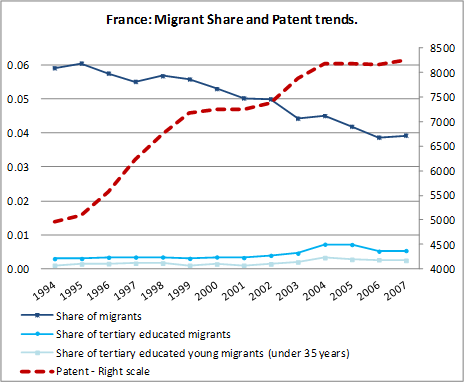 The three figures below show different national composition and trends of the patents and migrant shares by education and age. 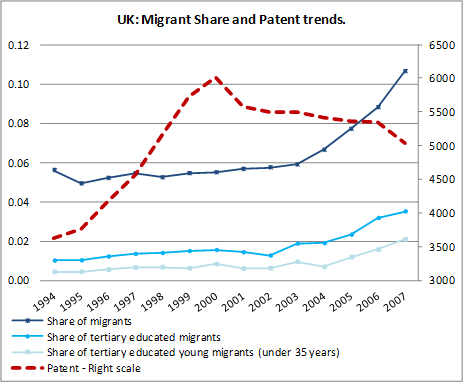 The preliminary results of the research suggest a positive correlation of highly skilled migrants and innovation, i.e., highly skilled migrants tend to favour innovation as revealed by an increase in the number of patents. However, the impact of the highly-skilled on one side, and the low-skilled on the other side, varies between migrants and natives. Also, the age composition of the labour pool plays a different role. The results indicate that both the young and old workers are spurring innovation but the results are not homogeneous and differ according to the country specificity. In the UK, innovation is generated mostly by highly-skilled migrants who are in a more advanced phase of their working life. However, highly-skilled young migrants and low-skilled older natives also contribute to innovation. In France, innovation is stimulated by both highly-skilled natives and low-skilled migrants; it is especially promoted by the young population in both categories. However, older migrants also contribute to innovation. Finally, in Germany, both the highly-skilled and low-skilled migrants (especially those who are older) play a positive role in innovation along with low-skilled natives. Furthermore, data suggests that natives favour innovation when they are young. Please note that the results presented are preliminary as the positive impact of highly-skilled workers, both native and foreign, is limited inside specific sectors. Thus, the result underestimates the total positive effect of human capital changes as the complementarity between sectors and the positive spill over are not taken into account. The effect of immigration (of skilled and unskilled migrants) on innovation is measured at the sectoral level, in three EU member states (UK, Germany and France) in the period 1994-2007. Sectors are defined at the two digit level of NACE classification. The results of the research are preliminary using a production function of the innovation in the manufacturing sectors (measured by patents registered in each country-sector explained by openness to trade, physical capital, expenditure in research and development, the previous stock of patents, and human resources). For the purpose of this research, in Germany ‘young’ is defined as those who are under the age of 40; while in UK and France, it is defined as someone who is under the age of 35. Readmission Policy: where is the carrot though? The proclaimed new EU Global Approach to Migration and Mobility (GAMM) presents important contradictions: while it seeks to facilitate and organise the legal mobility of Third Country Nationals and to ensure that TCNs in need of international protection, receive it, it also aims at strong border controls and particularly emphasises readmission policies. In this short piece we look at past experience on readmission cooperation with Albania and at the current readmission ‘hot potato’ notably cooperation with Turkey. The readmission of irregular migrants and refugees who entered the EU territory constitutes one of the biggest challenges that EU neighbouring countries are confronted with. There are cases of third countries who have been re-admitting large numbers of irregular migrants (including own nationals) and potential asylum seekers. For instance, the visa liberalization between the EU and Albania, which has been in force since January 2011, has been a ‘reward’ for, among other things, a good record of readmissions of its own nationals from Greece over the years. This is an example of how collaboration works even though considerable policy gaps in the re-integration of readmitted Albanians are identified, e.g. there is hardly any assistance for them to find a job and/or reintegrate in their communities of origin, so that they would not try to cross the border illegally again. There are, however, also third countries whose readmission record is rather problematic. A case in point is Turkey and its failure to implement the Re-admission Protocol that it has signed nearly a decade ago with Greece. During the period 2006-2010, Greece had filed 3,431 readmission requests to Turkey, in the context of this Protocol, concerning 62,816 people. Of those 7,359 were accepted for readmissions by Turkish authorities, but only 1,281 were effectively re-admitted to Turkey. It is our contention that a successful readmission policy has to look closer into the political economies of the third country in question, notably Turkey, in order to understand its capacity and eagerness or reluctance to implement the Readmission Protocol and to tackle irregular migration flows with a view of arguing convincingly about the visa facilitation or visa exemption altogether. The visa liberalization between the EU and Albania, which has been in force since January 2011, mainly offers Albanians the opportunity to seek short-term and seasonal informal work in Greece (Maroukis and Gemi 2011). Indeed such a strategy fits well with the political economy of Albania. Offering its citizens the opportunity to travel legally and work informally in neighbouring Greece eases the pressure from rising unemployment, a welfare regime under pressure and an economy that lacks basic infrastructure for achieving better distributional effects from the insertion of FDI over the last decade in the country. The case of Turkey is not so straightforward. Commenting on the recent initiative by the Austrian government to discard the requirement of competence in German for Turkish citizens when applying for a residence permit for the purposes of family unification, the Turkish Minister of European Union Affairs Egemen Bağış characteristically stated “they [EU member states] are welcome to go ahead if they plan to carry out some sort of facilitation of the visa process. But what Turkey deserves is a visa exemption”. Although the external anchor of EU membership has functioned during most of the 2000s as a powerful incentive for Turkey to proceed with substantial political and economic reforms (Öniş 2012), Turkey’s economic growth record so far has given ground to the ‘’apparently paradoxical conclusion that whether Turkey becomes a member or not will not have such a dramatic impact on the quality of its economic performance and the nature of its democratic regime’’ (Öniş & Bakır 2007: 161-2). However, a key variable behind Turkey’s economic and political (in)stability in the coming years is the way Turkey addresses its developmental and re-distributional challenges. The highly fragmented and hierarchical corporatist social security system in Turkey providing health and pension benefits only to formally employed individuals coexists with a labour market structure where self-employment, unpaid family labour and informal employment practices are very important (Buğra and Keyder 2006). Part of Turkey’s informal economic activities is migrant smuggling. Significant marginalised segments of Turkish society and marginalised regions (especially in the South-East) have been earning a living from this illegal activity (Triandafyllidou and Maroukis 2012, Danis 2006, Icduygu 2004), alleviating thus the pressure from the re-distributional inequalities (often tinted with political colours, e.g. the Kurdish issue) that the Turkish political economy faces. For Turkey to engage into an effective readmission policy and for an effective dismantling of irregular migration networks, the EU needs to achieve better knowledge and understanding of how these are intertwined in Turkey’s socio-economic structure. What works with Albania as a visa regime might not work for Turkey. The incentives for Turkey may be different also because the bulk of third country nationals that it would have to re-admit are not its own nationals. Hence, the carrot that the EU has to offer is a wider regime of visa exemption, plus human resources and technical know-how assistance that would help Turkey build a more effective border management system at the Turkish eastern borders. Such a ‘carrot’ would make the ‘stick’ (notably readmissions and the dismantling of the migrant smuggling networks) worth it and would provide a more durable answer to the challenge of irregular migration flows from Asia to Europe via Turkey and Greece.